We have all of your card needs covered with a broad range of features. Select the type of card you need below for complete details. Why Get Your Cards From Us? We ship to anywhere in the continental United States for FREE. Once we have your design finalized and your options selected, we can print you order within 4 to 7 days. We are proud to support America by keeping jobs here, so all cards are printed right here in the USA. High quality digital printing is available on both sides of these standard 3-3/8″ x 2-1/8″ CR-80 (Credit Card Size) 30 mil plastic cards with either HiCo or LoCo Magnetic Stripes. This is the standard size used today for most card products: gift cards, loyalty cards, membership cards, etc. Composite cards are the low-cost solution and the most durable cards available. They’re produced using a 3-piece construction process consisting of a custom printed 10 mil teslin core, finished with 10 mil lamination layers front & back. 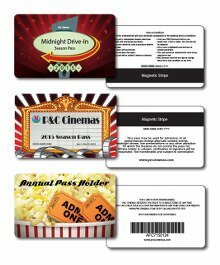 We offer a fast turnaround and these industry standards cards will work with virtually any POS system. Full encoding services are available, as is bar coding and variable imaging. 30 mil thickness is the standard, but other thicknesses are available. High quality digital printing is available on both sides of these standard 3-3/8″ x 2-1/8″ CR-80 (Credit Card Size) 30 mil plastic cards with either HiCo or LoCo Magnetic Stripes. This is the standard size used today for most card products: gift cards, loyalty cards, membership cards, etc. Cards are 100% PVC with UV coating. We offer a fast turnaround and these industry standards cards will work with virtually any POS system. Full encoding services are available, as is bar coding and variable imaging. 30 mil thickness is the standard, but other thicknesses are available.